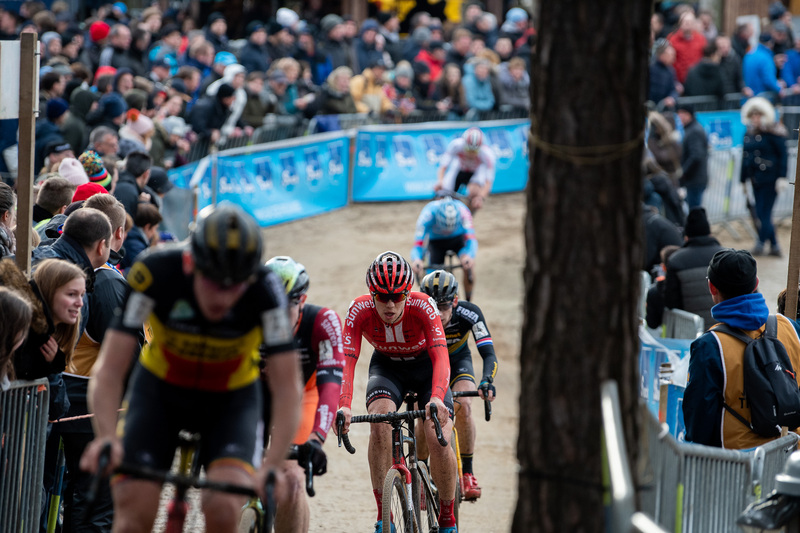 Krawatencross Lille was the final race of the DVV Trofee series. 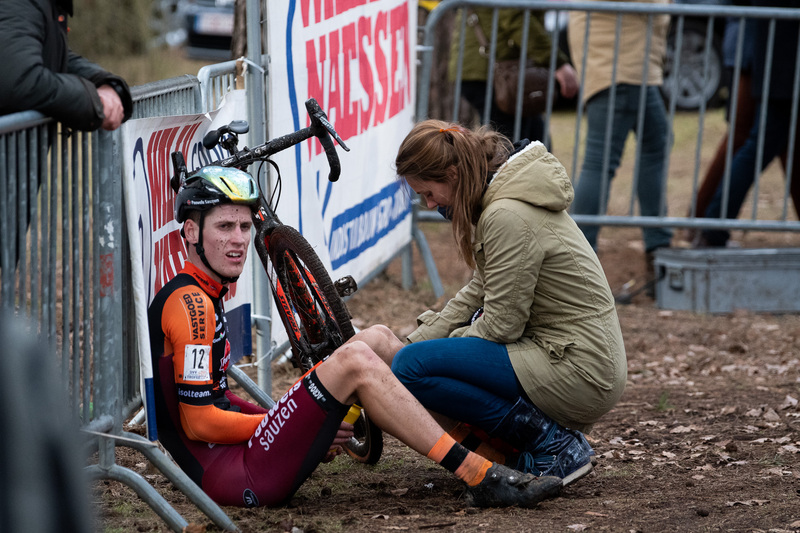 These post-Worlds races can sometimes be a place for riders who have not scored podiums throughout the year to come through and get some points in reduced fields. 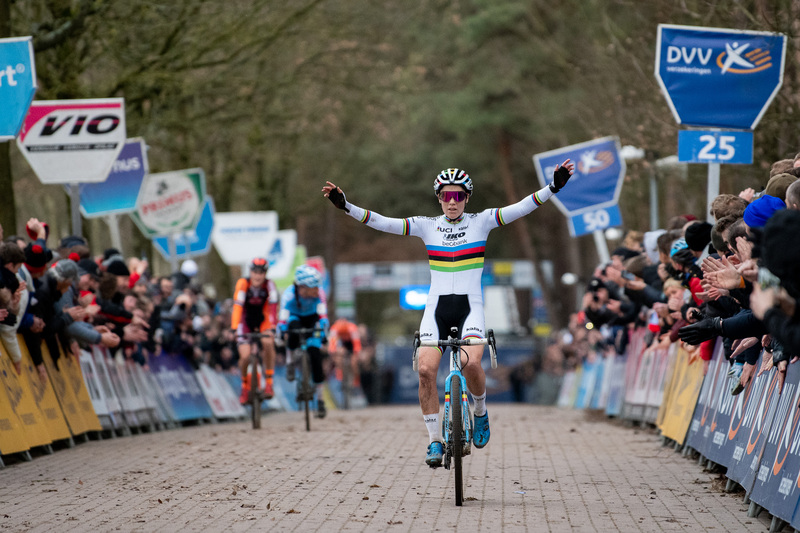 This year though, the favorites came through, with Sanne Cant winning the women’s race and Matthieu van der Poel taking the men’s. 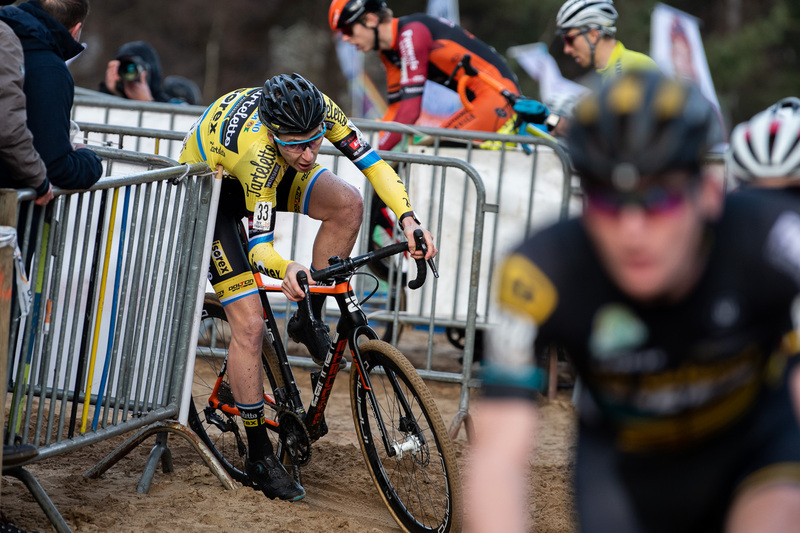 One notable absence was Wout Van Aert who raced midweek and then decided to close out his cyclocross season in order to prepare for the quickly approaching spring classics. 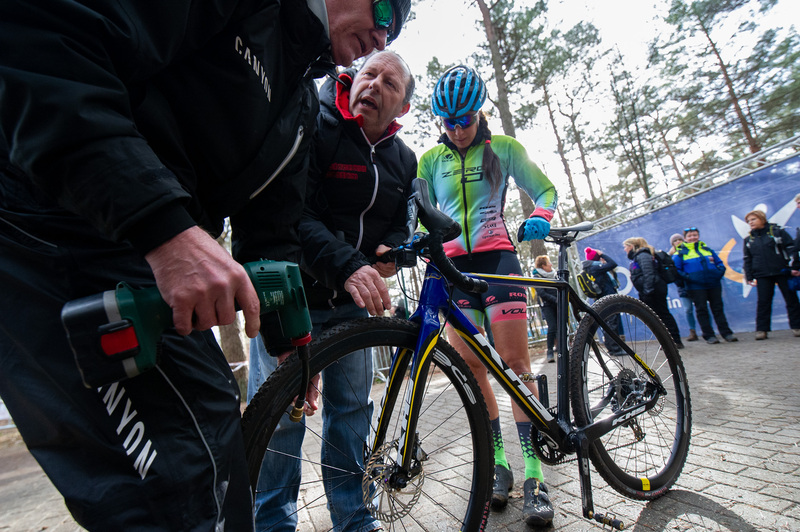 Rebecca Gross’s mechanics adjust her tire pressure before the start of the race. Gross finished on the lead lap in 47th place. 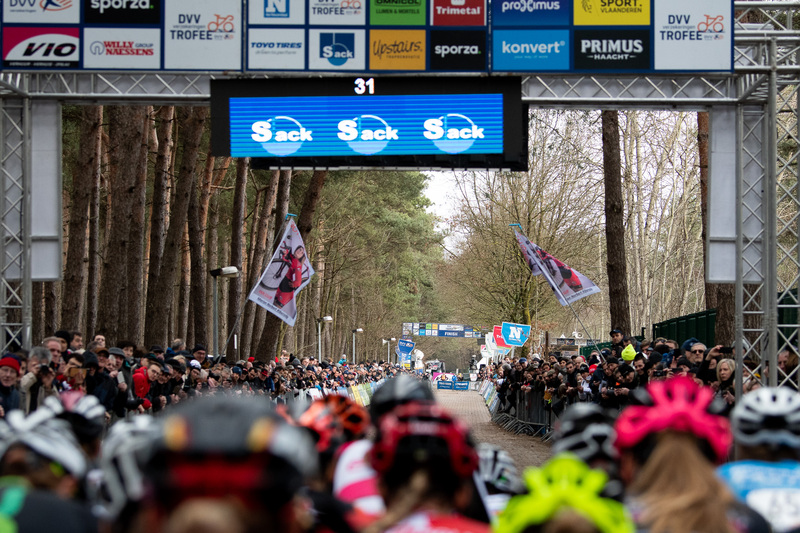 Sanne Cant on the start line. 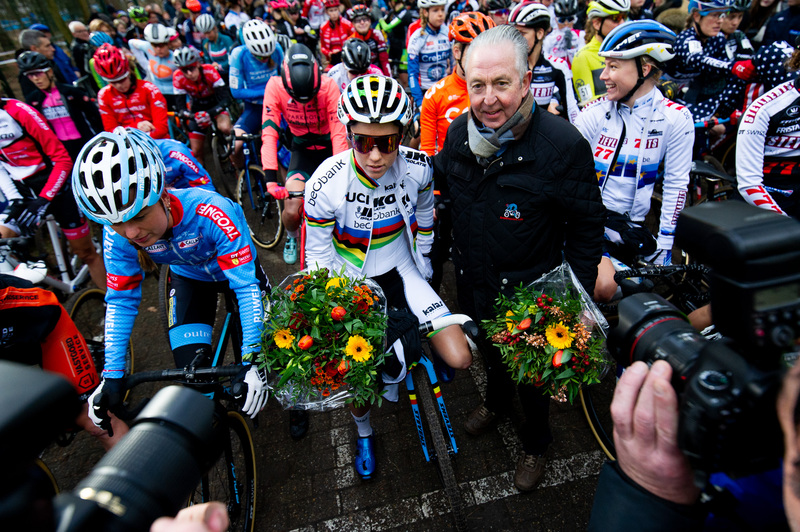 Cant received flowers on the start line and was congratulated on her third rainbow jersey. The field, and the fans wait for the signal to start. Rebecca Fahringer descends off the tall fly-over. 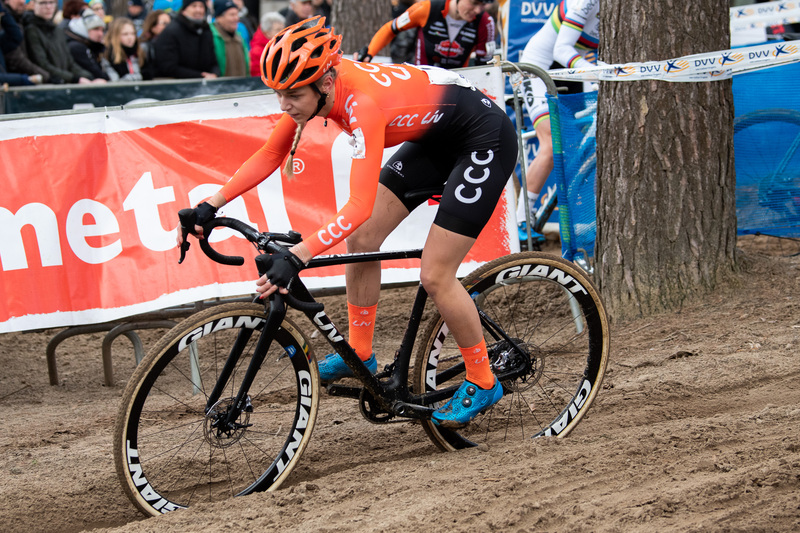 Fahringer and her teammate Kerry “Kenny” Werner both raced in Lille. Fahringer finished in 28th place. Erica Zaveta rides through the sand after the first fly-over. Zaveta was one of three Garneau-Easton riders who raced in Lille. She finished in 29th place. 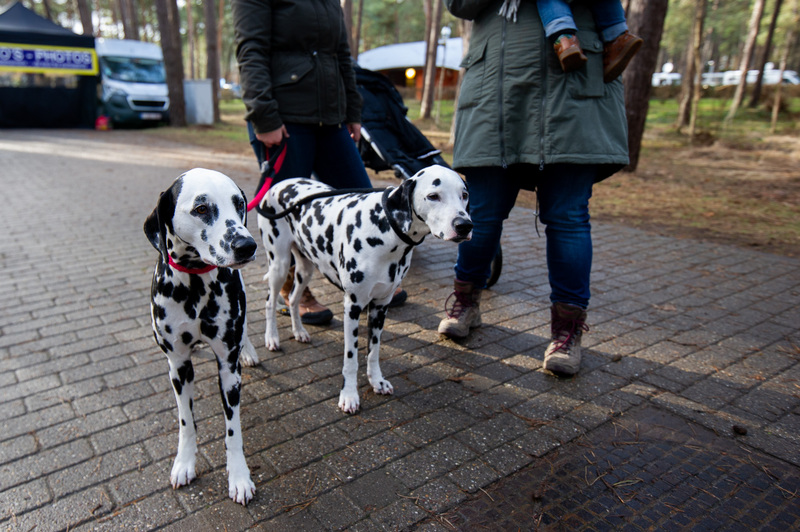 Inge van der Heiden. Van der Heiden finished in fourth place, just 4 seconds off the podium. 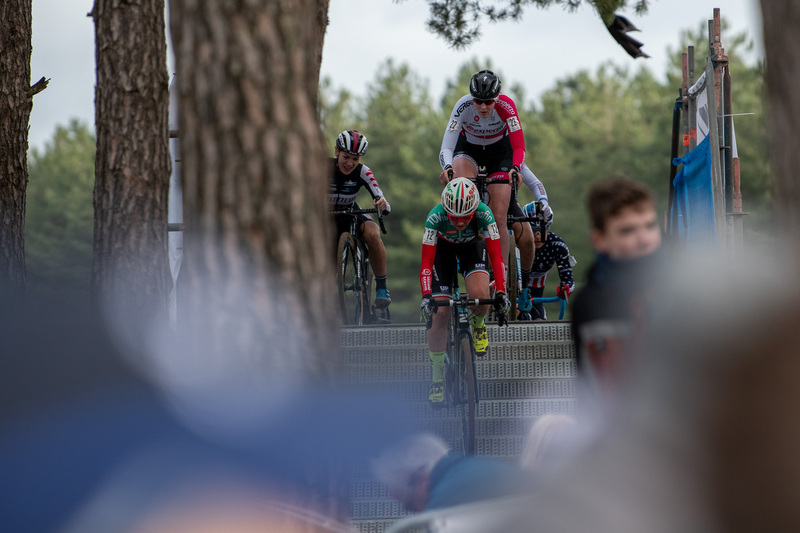 Eva Lechner descends off the smaller fly-over followed by Bakker, Worst, Kastelijn and Compton. 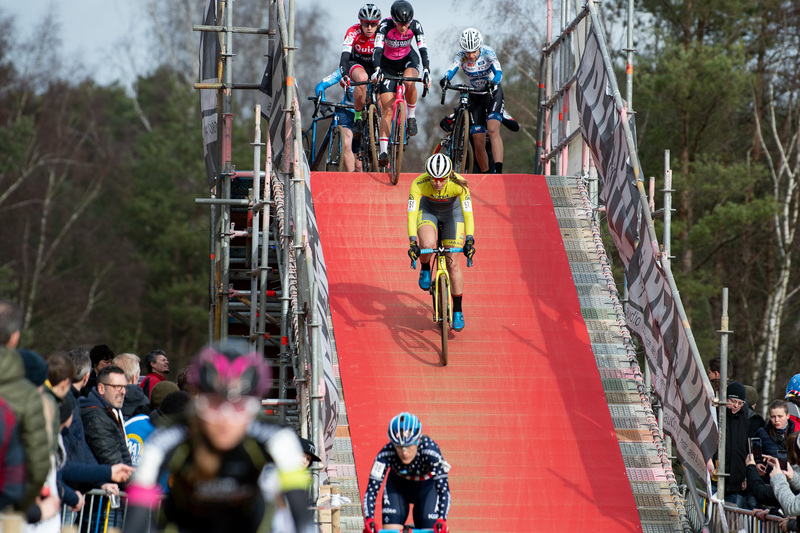 Katie Compton and Laura Verdonschot ascend the tall fly-over. 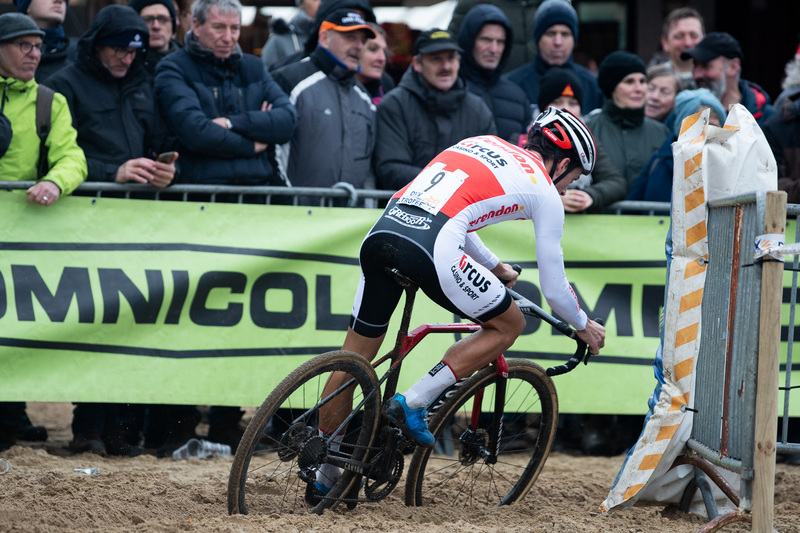 Compton finished the race in 7th, one place ahead of Verdonschot. Kelly Van den Steen on the tall fly-over. The Lotto-Soudal rider finished in 37th place. 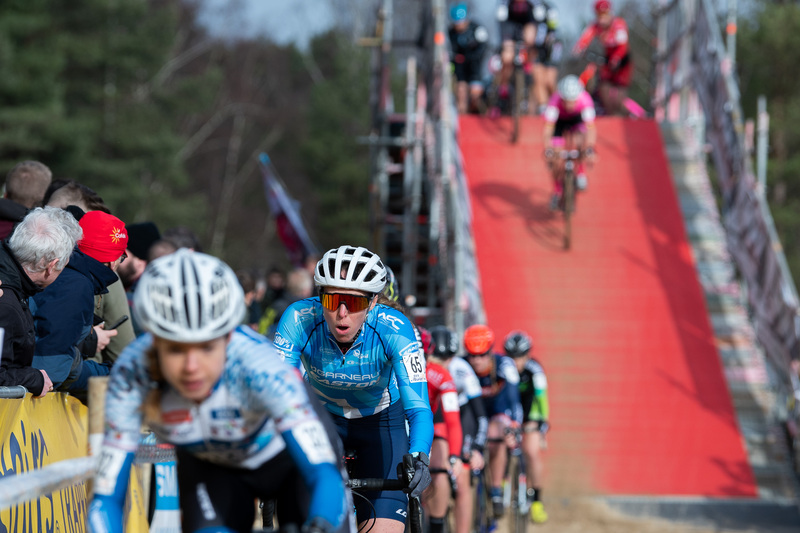 Sanne Cant wins Krawatencross ahead of Denise Betsema and Loes Sels. 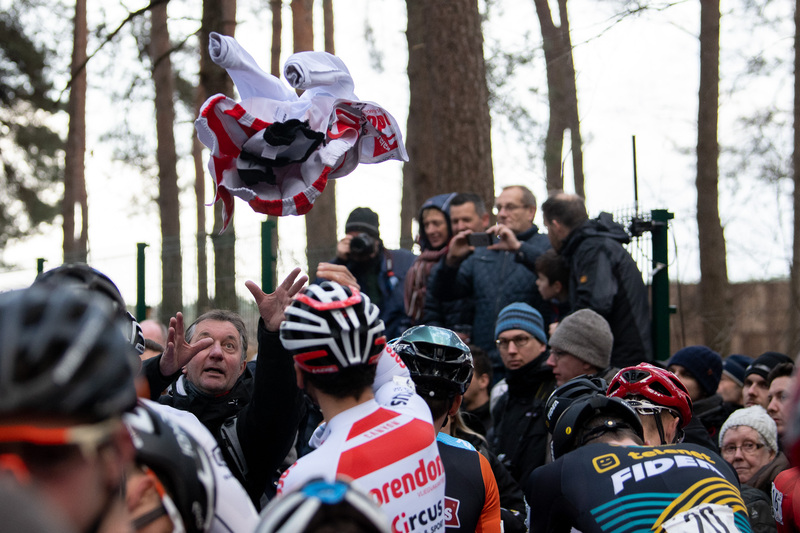 Tom Meeusen tosses his jacket at the start. 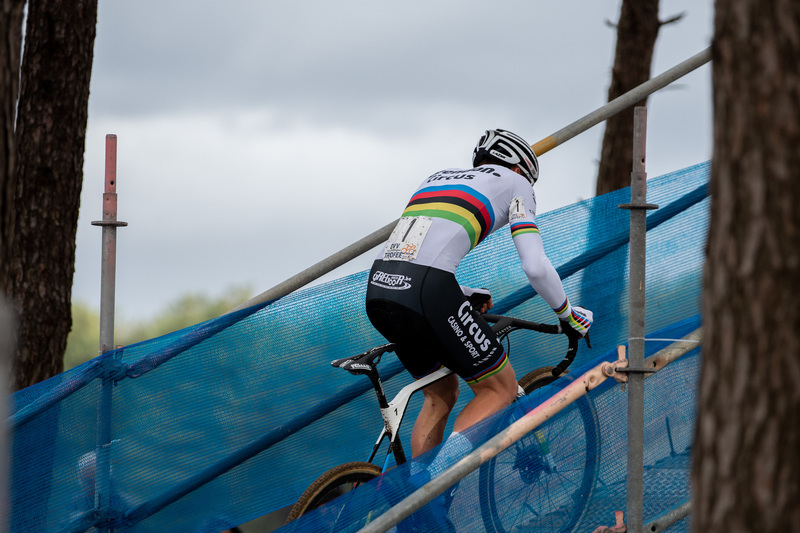 Ingmar Uytdewillingen clips a post in a tight corner of the course. Eric Thompson in an S-turn section. Thompson was the second-placed American finisher in 35th. 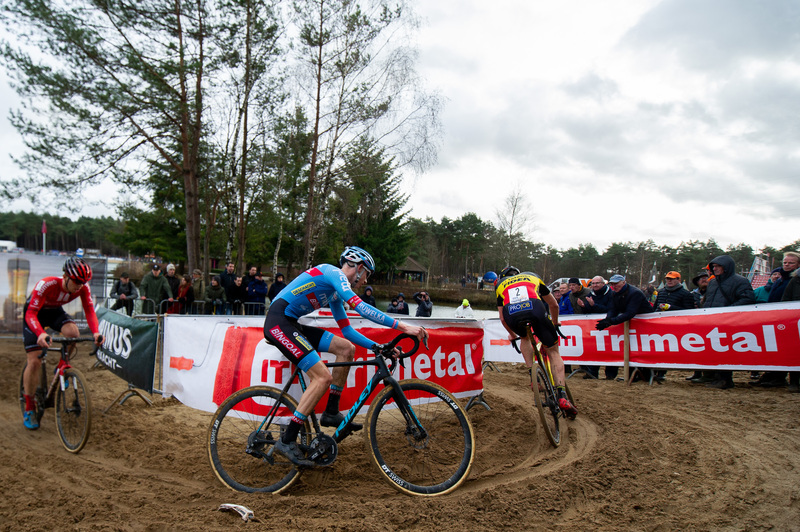 Joris Nieuwenhuis rides in a pack chasing race leader Mathieu van der Poel. 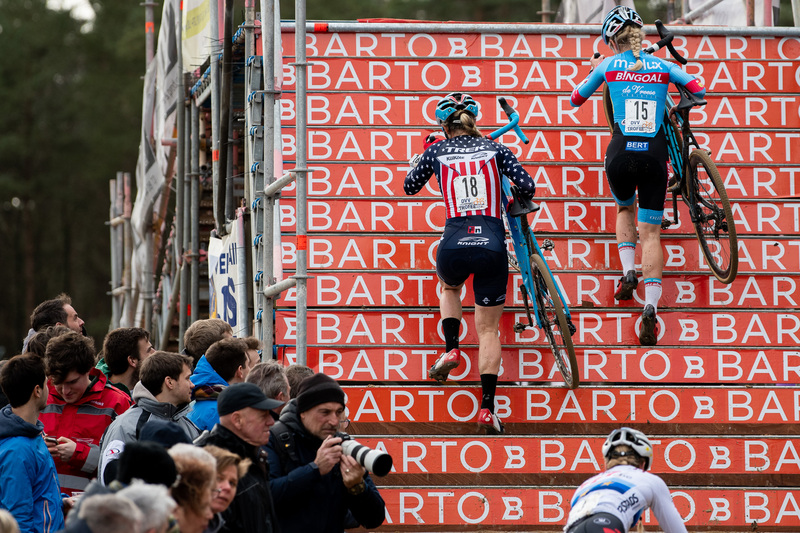 Eventual third place finisher Toon Aerts followed closely by DVDP and Laurens Sweeck. 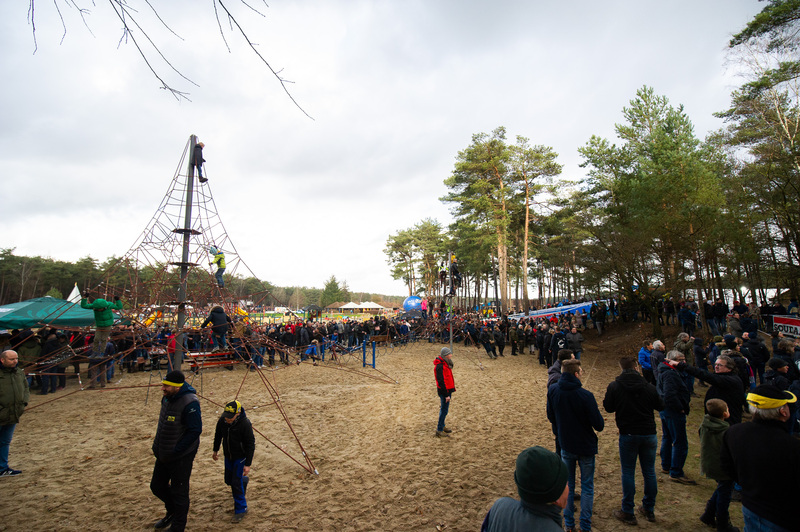 Krawatencross is held at Lisle de Bergen, a campground and recreation park in Lille, Belgium. 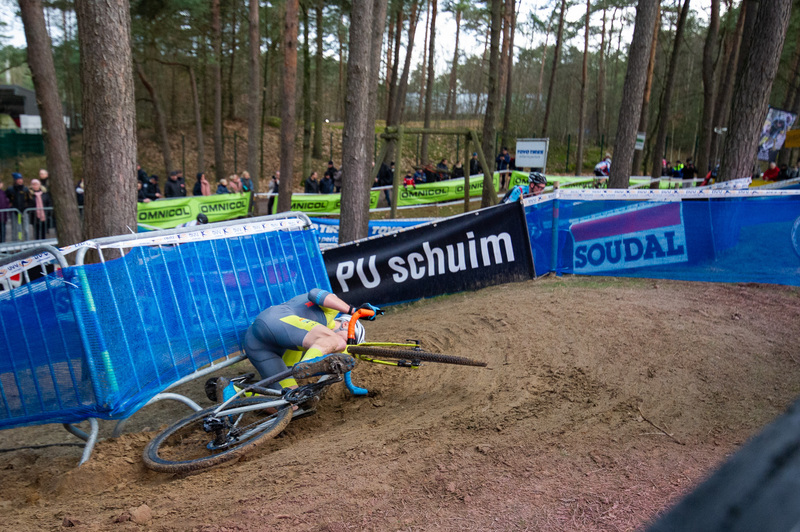 Kerry Werner takes a spill on one of the S-turn sections. 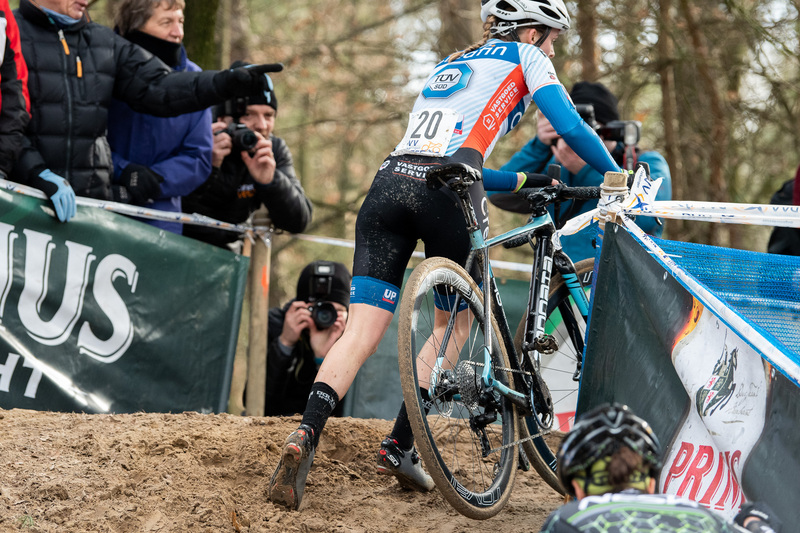 The ruts in these section are very close to the inside barriers and there is very little margin for error. 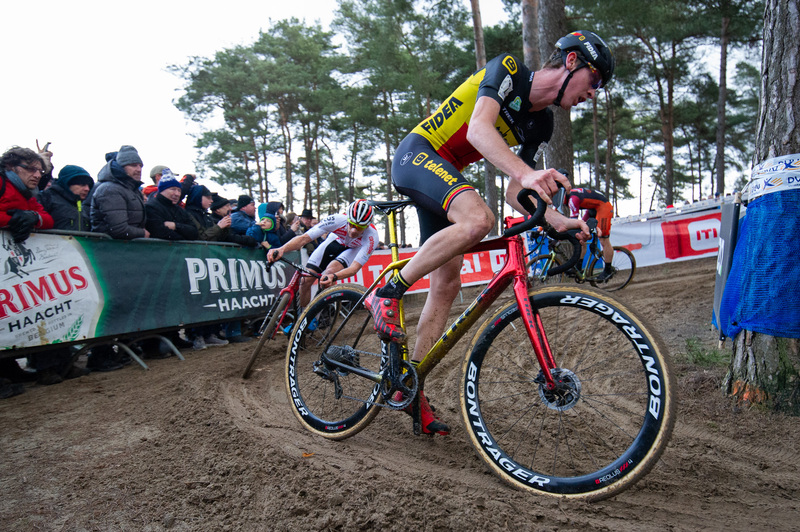 Tom Meeusen cornering in one of the deep ruts that characterize the Krawatencross course. 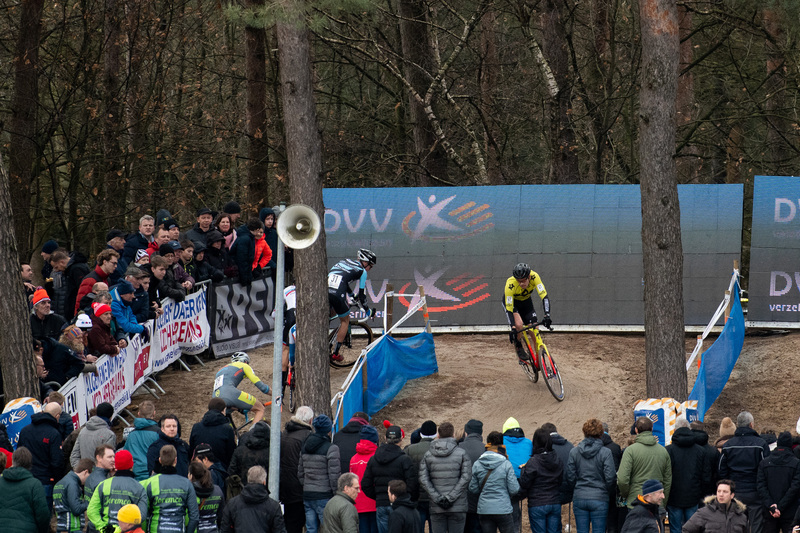 Joris Nieuwenhuis, Michael Vanthourenhout and Toon Aerts on the penultimate lap. 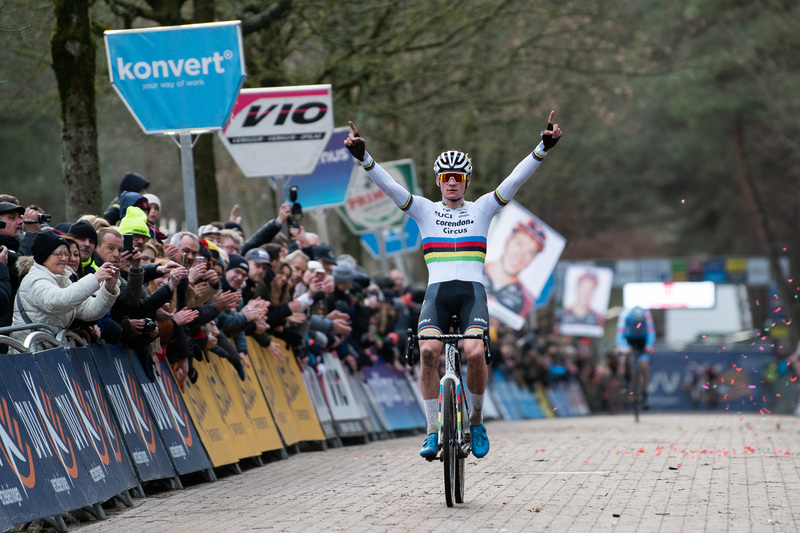 Mathieu van der Poel wins Krawatencross. Jens Adams after the finish. Adams finished the race in 15th place. 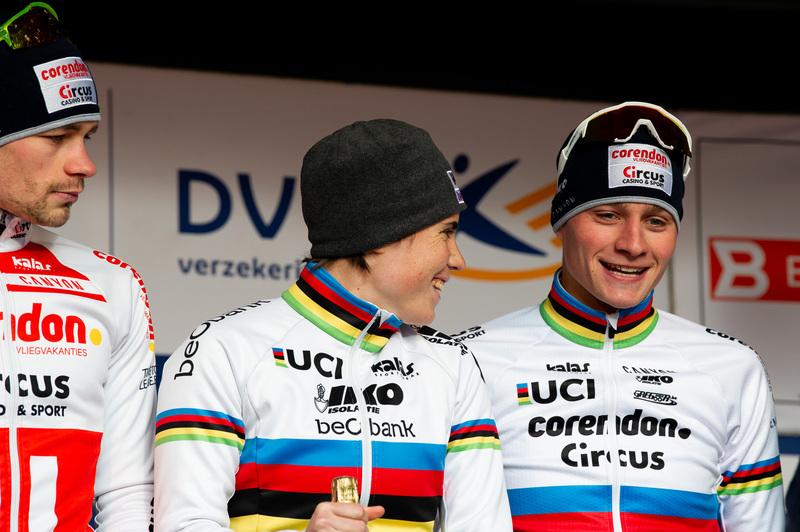 World Champions Sanne Cant and Mathieu van der Poel on the podium for best team in the final standings of the DVV Trofee.